Mamas & Papas Armadillo strollers are taking over the world! LOL. Everytime I turn around, there is another Armadillo model out. With so many different models it’s very easy to get confused. I get a lot of emails from parents asking what the differences are. Well, today I will give you a full comparison of all five Armadillo models so you can choose the right one for you. It all started in 2014 with an Armadillo model which is a lightweight stroller (only 17 lbs) that has super compact one-hand fold, small footprint, very roomy seat, deep one-hand recline, huge canopy, and large basket. The great thing about it is that you can create a bed like environment for your child by lifting up the leg rest and fully reclining the seat. Also, since it has a travel system option you can use it from birth. The Armadillo was designed for everyday life like running errands, public transit, grocery shopping and traveling. I fell in love with it the minute I saw it. And have you seen how stylish it is?! So dang cute! Needless to say, this buggy became insanely popular among the parents right away. This created a huge competition for beloved Britax B-Agile and Baby Jogger City Mini. After seeing such a great results, Mamas & Papas release another model called Armadillo City. The City model has a lot of the same features as Armadillo like huge canopy, all-wheel suspension, deep one-hand recline, easy one-hand fold, but has smaller foot print, narrower frame, smaller wheels and therefore lighter weight of 15 lbs. This model was designed to replace an umbrella stroller. Since it does not have a travel system option, this is a great second stroller option. Of course City model also became very popular since many parents don’t like how small the basket and the canopy are on umbrella stroller and would rather get a lightweight stroller with a compact fold. As you probably know, most parents want to have a reversible seat so they can see their child. So Mamas & Papas decided to create a model very similar to Armadillo, but with the reversible seat. In 2015 the Armadillo Flip was born. It has all the great features of the Armadillo plus the reversible seat. Of course this upgrade came with a weight increase of 3 lbs making it 20 lbs. The great thing about Flip is that you can still fold it with one hand with the seat attached in both modes. You will be also happy to know that it can be converted into a travel system by replacing the seat with an infant car seat or you can even convert it into a pram by replacing the seat with a bassinet. Very cool option! While all of these model where very popular, there were still some complaints from parents. Many didn’t like the fact that there was no mesh in the canopy to improve the air circulation on a hot summer day. Another complaint was about non-adjustable handle bar. Small wheels was another reason some of the parents went with different brands. It look like Mamas & Papas really listed to the customers and in 2015 they released two new models Armadillo XT and Armadillo Flip XT. Of course this release confused the hell out of everybody. LOL. I was the first one to say: What? They just released Flip and already upgrading it? The Armadillo XT is the same as XT, but has mesh panel in the canopy, larger wheels, and adjustable handle bar. The same updates where done on the Flip model. The Flip XT has mesh panel in the canopy, larger wheels and adjustable handle bar. That’s it! The XT addition made me very happy, because I was one of the complainypants parents. After testing Flip XT, I was convinced that if I had to do it all over again and pick ONLY one stroller, I would go with Armadillo Flip XT because it has absolutely everything that I want in the stroller (except for the bumper bar). Keep in mind, this is coming from a COMPLETE stroller addict who has way too many strollers. Let’s get to the detailed comparison. 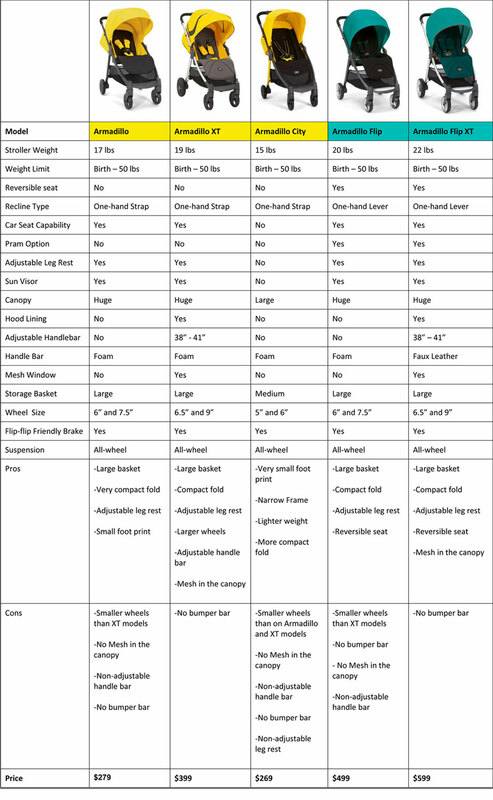 For some reason most companies don’t think it’s important to provide customers with a comparison chart for their strollers. Parents have to spend HOURS trying to figure out the differences between strollers. Augghh… So frustrating. Note: The chart below is a little small because I just couldn’t fit the whole thing into the page, but you can see a larger version by clicking on it. I want to say a few words about the price. I think that the Armadillo family is very well priced. You are really getting a lot of great features and high quality for your money. The Armadillo Flip XT is the most expensive model, but it also has the most features. So I think that for ONLY stroller $599 is a very reasonable price. BTW, I also put together a comparison chart for Flip XT vs Urbo2 vs Sola2 MTX in case you are wondering how they compare. I just found this great video overview of the whole Armadillo family. Let me know if you have any questions or need help narrowing it down. I am here for you! How easy is the fold of the strollers with the added foot muff or cocoon? Will I have to remove the foot muff or cocoon to get the stroller to fold down? I live in the city and I take public transportation constantly. During the winter months, it would be very unreasonable for me to have to remove the baby and the foot muff/cocoon to fold up the stroller to ride the bus. That means I would have four things to carry…baby, diaper bag, stroller and foot muff/cocoon. I’m really struggling to find a solid, lighter weight stroller that will work for things like walking to restaurants, the zoo/aquarium/Epcot. I have a hard time justifying more than $300-350. Personally, I do not care for City Mini or B-Agile. I was leaning towards the Uppababy G-Luxe, but I know it’s not one of your favorites, though some reviewers rave its flexibility. Do you think the Armadillo or Armadillo City would fit the bill? Or a different stroller suggestion altogether. The Armadillo Flip ST seems wonderful, but isn’t a bumper bar an essential part of a stroller for providing baby a place to hold their sippy cup, snacks and the like? I very randomly bumped into a lady whilst shopping today who had the same pushchair as me (armadillo flip Xt) she asked what I thought about it, I genuinely love but feel it’s a bit rickety but put this down to the ability to flip and she told me she was on her 2nd chassis as apparently the first batch had a fault, making it feel rickety and also making the seat not lock properly causing the seat to flip backwards, this has happened to me but thankfully my baby wasn’t in it-her 12week old was 😳 Anyway she told me how she called M&P and they have apparently recalled early batches (I got mind Feb 2015 and hadn’t heard anything) so I tried my luck calling mamas and papas customers care line, literally 5 mins later new chassis has been dispatched and a new hood (that’s another story, my current one pops back when I go up/down curbs, doesn’t matter really but I thought I may as well mention it) M&P were incredibly helpful, could find my original purchase over a year ago and didn’t even question it, chassis being delivered tomorrow and I don’t even have to send the old one back. I wonder if the ricketyness is a fault?! Just feels like it needs a screw tightening. At first I was looking to buy the armadillo city stroller but i ended up buying the baby jogger city mini single and I love it! with this stroller you can add whatever accessories you want with it. they have a snack tray or bumper bar. its seriously an amazing stroller and i did my research… I use my baby jogger city mini on the subway and and when i dont feel like taking my orbit baby g3 in and out the car. Your reviews are extremely helpful! I’m a first time mum, expecting my baby in two months and still can’t decide on a stroller! I was at Mama’s and Papa’s today and liked both the Sola 2 and Armadillo Flip and their newer editions. I also really like the Stokke Scoot v2. I live in a really hot country (Kuwait) and my priorities in the stroller are easiness of opening/closing it, a reasonable weight I would be able to carry as well as durability and robustness. Prices here are also more expensive than in the US. I initially thought of Graco but was alarmed after reading about the recall. The Chicco Cortina travel system is also cool but for some reason unpopular where I live. I also feel these two brands have more of a traditional design, not the type which puts the baby at mummy’s level, which I prefer. How can I choose between them? And to what extent is a bumper bar important? I’m soo confused! Living in San Diego my husband and I are pretty active and definitely want a Bob for trail walking and running. With that being said I’m having a hard time picking our second stroller! Currently deciding between the Cruz, Armadillo Flip XT or MIXX for daily errands and strolling. Any feedback or suggestions? Thank you so much for the quick response and helpful information! Your site has been the biggest help! I’m so thankful to have found it! In your opinion are the upgrades from the Flip to the Flip XT worth the $100 since we will also be using a BOB for rougher trails long distance walking? Hi Susan, this is a fantastic review of the armadillo line. I’ve been looking at so many different reviews, but found yours to be the most comprehensive one. I own an armadillo since 2014 and dearly love it. My second baby is due in August and I am hoping to use the same stroller for her. I know it is recommended for newborns up… but in your opinion is it really suitable on its own? Would you recommend getting the newborn cocoon with it? I noticed it does not truly recline, like the armadillo flip. Hi Susan, i am a new mom and looking for a stroller which has reversible seat and foot rest and laying position is flat. We are looking between Armadillo flip xt and new mountain buggy urban jungle luxury collection. Are they both lightweighted and one hand folded? This is a great review of the armadillo family. Aside from above do mentioned difference between armadillo flip and flip xt, is the seat size different between the flip and flip xt? I am trying to decide between the City Mini GT and the Armadillo XT or Armadillo. Price is an issue- mainly I really need a good, large, accessible basket. I have 4 year old twins and this is for my 6 month old, so I haul a LOT of stuff around. I had a City Select for my Twins and I feel like I need a good basket. The only store that sells these near me is a bit of a drive so I haven’t seen an Armadillo in person and I want to! Would the Armadillo XT do okay on a gravel trail? We have a great walking park near me that I’d like to use. Thanks! Hi Susan! I am also debating between the city mini GT and the Armadillo XT. My main priorities are compact fold, nice wheels and good canopy (I already have an uppababy g-luxe and I am buying this stroller to replace my peg perego book plus which takes up way too much space in the car). What would you recommend? Hi! I would like to buy the Flip model because it is the only model available in my country. I have only a question, me and my husband are tall. Could it be a problem? Does the foot brake still require the top of your foot to unlock? How is this flip flop friendly? Thanks for your reply and your recommendations. I did check the three models that you suggested. However, they are all on the heavier end compared with flip Xt or sola2 mtx. I called Mamas& Papas and they said they might change the design of flip Xt to include the bumper bar next year and might release more colours for sola2 mtx next year. They asked me to call back in January 2016. I will for sure do that. I’m due in late April. So, I’m not that in a hurry. Thanks again! I’m having the same difficulties making a decision as Kayla mentioned and started searching in ebay for a universal bumper that will fit the flip Xt. My due is December 2015 so i don’t have time for Mamas and Papas upgrade. Do you have any recomendations for such a bumper? Thank you SO much for all of your wonderful reviews! I am currently deciding on a stroller that will be appropriate for plane travel. I like the Armadillo City but prefer the look of the Armadillo Flip (I’m ridiculous I know!). When folded, is the Flip bigger than the City? Do you have any other recommendations for airport friendly strollers? Hi Susan, I’ still wondering about my question regarding the Armadillo City and Flip? I currently have an Armadillo, bought in early 2014. We love it, however as my toddler grows, he doesn’t love the seat because it’s not sitting up enough for him. Do any of the newer versions sit more upright? Hi, thanks for these reviews, i’m looking at buying the flip xt, but when i viewed it i felt that the area where the harnis comes up from between the legs is very close to the back of the pram (not much room to wiggle or grow in) what do u think? I’m torn between the Nuna Mixx and the flip Xt. I live in a colder climate and the sidewalks in my town are a bit uneven. I’m struggling which one would be better for use in these conditions. And I’m leaning towards the Nuna Pepp as my umbrella stroller to work with the nuna carseat system for easier in and out of the car. But I’m so torn on my main stroller! Still looking for a compatible bumper bar for Armadillo XT flip… Would love to hear if someone found a suitable one. Hi, I really love all your reviews they’ve really helped me narrow down my stroller decision. Im expecting my first child in February and have decided on the M&Ps Armadillo flip XT. At first I was undecided between the UppaBaby Cruz or the Armadillow FlipXT. I’ve gone and tried them both out and love the Armadillo Flip XT’s compact fold. My only contention was the customer service of Mamas and Papas, since it is a british brand. Please let me know if you know about how they work when ordering parts, with recalls and etc. I’ve heard UppaBaby has amazing customer service. Also how is the resale value of the Mamas and Papas strollers. Thanks! We have an armadillo that was purchased early 2014. We love it. But the one thing that bothers me is that the seat doesn’t really go upright. I feel like my son is always really reclined. Do you know if this has been updated in the 2015 or 2016. Or if it is maybe better with any of the upgrade models? Ours is wearing out and looking to get another one. This is soooooooo helpful , THANK YOU !!!!!!!! Hi Catherine. You are very welcome! Hi Susan! Loving your reviews and the comments and responses are so helpful too. I was wondering if you’d have any experience of using the armadillo original or flip with a buggy board? I have a toddler who is just turning two and an almost 4mth old but am very keen on avoiding a double stroller. My toddler is enjoying using the buggy board with our umbrella stroller, but the last time I tried pushing for a few hours in a shopping mall it did my back in! I checked out the armadillo range and love everything about it. I’d love to get the flip for the parent facing option. When the stroller is in parent facing mode, is it shorter than in world facing mode? I’m wondering because the buggy board website tells me that the buggy board is only compatible with the flip in partial recline unlike with the original where it’s apparently compatible in full recline mode. Another question. How easy is it to switch the harness heights? If I were to sling the baby and put toddler in the buggy for a nap but then later switch to putting baby in and letting toddler ride the buggy board, it would be ideal to have the straps on the right place without too much fuss. I hope you know what I mean, I’m holding a sleeping baby and falling asleep myself but look forward to your response! Thanks for a comprehensive review. I’m looking for a stroller that can be used from new-born to age 3+, is lightweight and compact for easy fold & storage in travel by air, road and rail and is car seat compatible. These are a lot of requirements and I’m considering the Armadillo and G-Luxe 2015. I should probably go check some out in stores but I wanted to get your thoughts on what could be a good match for my long list? Thanks for all your stroller reviews! 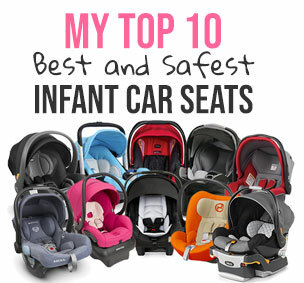 I’m a FTM and have a Keyfit30 car seat. I’m between The Chicco Bravo (love the basket but stroller feels too heavy), the Britax B-Agile (felt like the baske was too narrow and the fold wasn’t as smooth; also hate that the legs will just dangle when child is older), and the armadillo (or the st though not sure if worth the price difference). There is no p,ace around me or in my state that has the Armadillo to try out. It seems harder to get, even on Amazon (very limited quantities and it seems like the black one may not be available). Some reviews I read knock on the fold being stiff and gets the wheels stuck; others say the seat is not upright enough for an older child. Out of the Bravo, B-Agile, or the Armadillos which would you choose as your primary stroller for the next 3 years? The storage is important to me as well as the ease of fold. Thanks! Hi there, great reviews, I already have a BJ Versa which I love but also wanted something more compact for our small 7 seater boot. I tried a City Mini 3 and hated it so have convinced myself to get the 4 wheel version, although it is still quite big for the boot with all the seats up but I love the roomy seat units and huge canopy’s. I have a Cosatto Supa stroller still sat in the box because I know a City Mini will outlast this by far. A spanner has now been thrown in the works because I have seen the Armadillo City. It would be used for shopping and park terrain, which would you go for? Thankss for your help. I’d like to know if have a infant car seat that are compatible with armadillo flip XT without adapters.